Amsterdam is brimming with places with typically Dutch treats. Make sure you taste fresh, homemade stroopwafels or buy a tin to take home. One of the best places to taste this heavenly delicacy is the Albert Cuyp Market. The stroopwafel stand is easy to spot; a stroopwafel munching clientele in front and wafts of delicious aroma floating in the air. Is it a cookie, is it a waffle? This is a puzzle difficult to solve. Picture this: two layers of wafers and in the middle a sweet sticky caramel filling; the perfect must-try snack! When bought from a stroopwafel stand at one of the open-air markets in Amsterdam, the waffle is still warm and the filling gooey. 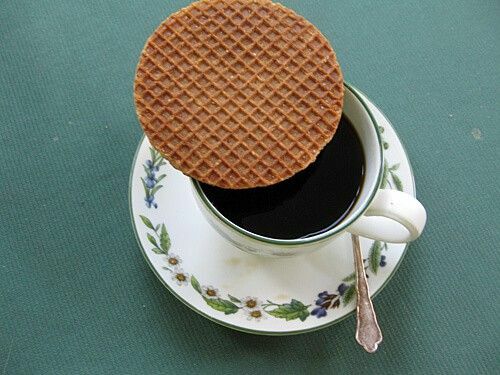 Otherwise, the ideal way to enjoy your stroopwafel is over a steaming hot cup of coffee, take this literally. Placing the stroopwafel on top of your mug, the steam softens the caramel filling. Alternatively, three seconds in the microwave does the trick too. The best place to buy your stroopwafel is at the Albert Cuyp Open-air Market or at one of the many Albert Heijn Supermarkts in Amsterdam or simply online from Amazon. On the other hand why not make them yourself? All you need is a waffle iron and here is the recipe for treacle waffles. Long ago at the end of the eightteenth century, a local baker in the city of Gouda (south of Amsterdam and also known for its cheese) was a frugal man and did not want to waste food. He created the first stroopwafel from left-over breadcrumbs mixed with black syrup. This sweet treat became so popular that at some time there were as many as one hundred stroopwafel bakers in Gouda. These days stroopwafels are no longer made from left-overs but from first class ingredients. A visit to Amsterdam is not complete until you have tasted a warm, gooey stroopwafel! A word of warning, though: treacle waffles are not suitable if you are watching your weight. Yet, they are impossible to resist.